Our mission at Yardworks Inc. is dedicated to providing consistent, dependable, and high quality landscape installation and grounds maintenance services. Our highly trained and educated staff provides the passion and professionalism needed for our clients to achieve their expectations and enrich their quality of life. Yardworks landscapes is one of the oldest and most trusted names in landscaping along the Crystal Coast. Our 28 years of experience and thousands of gorgeous projects throughout Coastal North Carolina have earned Yardworks a reputation for excellence, integrity and innovative landscape design. Upon hiring Yardworks, you will be confident in the fact that you have chosen trained professionals who are experts in their field, are passionate about their work and remain with you until the project ends and beyond. 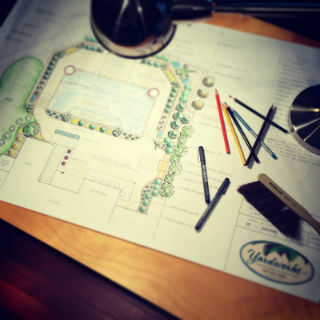 Our professional landscape designs are meticulously hand rendered by our in house designer and will not only increase the value of your home, but will become a wonderful, relaxing retreat that your family and friends will enjoy for years to come.